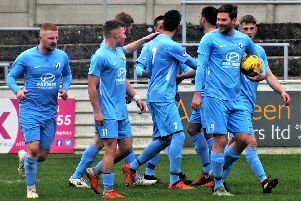 In a strange twist of fate, AFC Rushden & Diamonds could help their local rivals clinch the Evo-Stik League South Premier Division Central title this weekend. Kettering Town will be crowned champions if they avoid defeat at relegation-threatened Halesowen Town on Saturday. But should the Poppies lose, they could still clinch the crown if Diamonds beat or draw with second-placed Stourbridge at Hayden Road. However, Diamonds boss Andy Peaks insists Kettering don’t need any help from anywhere else and he is firmly focused on trying to lead his team to victory as they bid to keep their own play-off hopes alive. “At the end of the day, I want to win every game of football,” Peaks said. “And the truth is, if we aren’t going to win the league, I am not overly bothered who does. “What we do on Saturday won’t have a bearing on things. We will be going out to win, just like we do every week. The Diamonds and the Poppies will clash again before this season ends with the second county derby of the season due to take place at Hayden Road on Easter Monday (1pm kick-off).